Online Geomap Training, Tengraph Training PLUS the data CD. GoldTracker 600 searches for 50% off! Udo and I hope you had a great year metal detecting and you found plenty of gold nuggets and kept safe and well 2018. Right now we are in hibernation due to the heat but we are getting the 2019 Gold Prospecting Training Seminars information together and will send that out in January. So this is just a quick email if you are stuck for Christmas Gifts for the metal detectorist person in your life, here are some products with a big discount to celebrate Christmas. ....(Without spending a fortune on a Metal Detector that is!). GeoMap Online Training and Tengraph WEB Online Training AND all the Data You Will ever Need. GeoMap GOLD Product which includes the GeoMap Training Course Lessons AND Geomap Gold Data Thumb Drive. Express postage free in Australia. AND Access to Tengraph Web Online Training! The GeoMap Gold Data Thumb Drive. All the Mines in WA Database – Minedex. and 3 “Done For You” Projects for the whole of Western Australia. You simply copy everything to your PC by clicking on one usb_copy file which copies the required files from the Thumb Drive to your Computer C: drive. Regular Price is $174.00 – the Christmas Discount Sale Price is $100 Which includes Express Postage anywhere in Australia. Click on this Link to get the Special Discount Offer for GeoMap training. Here is the page we use normally to sell our bag. BUT DON’T BUY ON THAT PAGE – just have a look at the page if you want to see the bags! Metal Detector Bags - Designed by Metal Detector Users for Metal Detector Users. You can have a Protective Metal Detector bag posted for free (in WA – sorry it’s too expensive to post to the Eastern States or Overseas) or pickup in Perth. We have only 3 Camouflage, 3 Green and 2 black Bags left in stock so get in quick. The Green and Camouflage bags are available and Camouflage is more the Army Style colours on the bags available. 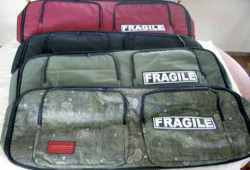 The Minelab 7000 Protective Bag Size is longer (1350 mm compared to the Minelab 5000 Bags of 1200mm) We have a few Maroon and Army Green Colour Cost $140. Goldtracker Massive Discount Offer Next Week. The big Christmas discount will give you enough clicks for you to really research gold prospecting locations AND the clicks will be useable until the end of 2019. Just to Recap what Gold Tracker Does for You. The Prospectivity or Potential of gold is the likelihood of the presence or absence of gold at each of these 1 million sites. This how is the score of gold prospectivity is calculated and allocated to each of those over 1m blocks in WA. Local gold finds and Historical records. The massive database immediately assesses the possibility Gold Mineralisation and provides a prospectivity score in every graticular block in West Australia. Even Better, if the area you have researched has a poor gold prospectivity score, THEN YOU JUST ASK FOR THE NEAREST BEST POTENTIAL LOCATION! The point is that this price will enable you to have hundreds of searches to use prior to prospecting next season so you can pick the best places to go. The Goldtracker team will be sending out the offer to their email list later this week, but here is a preview of the draft page for you. Hidden Link to GoldTracker Christmas 50% Off Offer. We will also send a email to you when we get the full details of the offer.